Okay, let’s start our interview. In Interv123, this session will be called LIMAWESATUHA. First question. WHEN, and how, did you realise that you have bipolar disorder and could manage yourself toward the condition? My psychiatrist was the one who made me realised that I have bipolar disorder. I was diagnosed to have bipolar disorder in November 2014 after a long two years process of monthly consultation with my psychiatrist. But since 2013 I realised that I had something unusual in my body. I clearly remember, it was around 11 pm in my friend’s house when I heard a group of kids were playing around. But my friend said he heard nothing. After that, I often felt depressed, cried without any reason, felt guilty, and I even tried to kill myself. In June 2013, I finally asked my father to come to Jogja and to accompany me to the psychologist at P2TKP Sanata Dharma, because my traumatic childhood memory kept running in my head. I also went for a consultation with a psychologist in Ghrasia Mental Illness Hospital, where I was taught a way to relax and sleep, as my insomnia was quite severe that time. I didn’t sleep for 3 consecutive days, I felt that I was tired physically, but my brain seemed like it didn’t want to sleep….. And I decided to go from my home in Paingan at 1.30am, walked all the way to Jalan Solo, and when I felt extremely tired I could sleep for around 4 hours in a shop’s veranda. I came back to my home around 9 am, also on foot. Ah, I really felt I was like a zombie back then. Umm… That was a long walk, tho’….. I didn’t experience any change from the psychologist consultation, the relaxation was not working, and maybe it was my fault that I want an instant relieve, I wanted my condition went back to normal as soon as possible. Then, I decided to go to a psychiatrist in RSUP dr.Sardjito. The psychiatrist, her name is Dr Wikan, was very surprised because I could go to the psychiatrist all by myself despite of my severe condition. I was given an antidepressant and antipsychotic drugs to relieve my hallucination. The next month, I went there again with my parents and Mbak Ellen, a very kind-hearted person who helped me a lot. Yeah, I know right, she’s a good person! Then? Dr Wikan said I experienced severe depression symptoms with a psychotic symptom as well. After that moment, I routinely consulted my condition, stop my medications because I felt better, then got the meds again because I had a relapse. Until, in the end of November, I had a suicidal attempt by cutting my wrist. Before the attempt, I wrote a BBM status saying ‘I hope I’m still alive tomorrow’ and called my father to come as soon as possible to our home at Godean. I got a whisper which said I better kill myself. There is no reason for me to keep alive, I better go die. Those words spun around my head, until I realised that I had a massive bleeding. I knew then that I did such a mistake, and I kept crying. When my father came, he also cried and brought me to RSUP Sardjito. It was such an intense pain. Dr Wikan took care of me immediately, together with the nurse in the emergency room. The nurse said, fortunately I did not cut my wrist too deep. It was late November 2014, I was then hospitalised in Teratai ward-RSUP Sardjito, and later on I found out that I was diagnosed with bipolar affective disorder with severe depression episode. I know all of my story sounds so dramatic, but well, that’s the truth. Ouch, so I guess it happened when you were the Chief for CF Student Choir, right? Exactly. In 2013 I was the Chief of CF Student Choir. I heard some bad talk that I got that condition because of the stress of being a chief, plus the burden to prepare the World Choir Games (WCG) programme. I would like to clarify that those were NOT the causes. Around October 2013 I decided to put down my job as the WCG’s committee chief, after some considerations from my psychiatrist as well as my parents. I think you can definitely guess what happened after I decided to retreat. Anyway, last month I just completed CT-Scan and EEG Test to find out the cause of the pain in my head (it feels like someone stick needles in my head!). However, the results showed nothing abnormal. This is what is called by psychosomatic. I could finally control myself after the hospitalisation period I mentioned before. The nurses there always supported me to keep on fighting, however painful and hard it was. They helped me to find a way to control myself if I had panic attack in the street or wherever I got my depression. When I was diagnosed by Dr Wikan to have a severe depression, I kept put the blame to God, I kept judge Him, because I really couldn’t accept it that I had this disease: a disease that considered as ‘insane people disease’ by most of our community members. Asylum is the only place for this disease. I was so depressed by that stigma, thus I always hid this truth because I felt what I had was so disgusting. But after times, it’s the other way around. I thank God, and I took it as His blessing, because He chose me to be the right person for this gift. I felt more support was given to me when I joined the support group therapy at Sardjito. I met Galang (a schizophrenic patient) and Mas Diksa (a severe-depression patient with drug dependency). They were the ones who made me to be kept thankful. And after that, I can finally start to accept the reality and began to speak out about my condition. I start to be able to control myself, and did not fall too deep into my own feeling or the extreme mood-swing I had. WHERE did you spend those times? There are a lot of places, a silent witness of my hard times. I was once walking to Gua Maria Sendangsono (St. Mary’s pilgrimage place at Sendangsono), at midnight hours, alone, and cried all the way. I was also got a panic attack at Jalan Solo, then I was hugged by a lady who calmed me down. I attended the weekday masses at Kotabaru Church several times when I experienced my depressive episode, and all I could do was just crying. Once, I cried without any reason at class when I was having lecture. And on the time like that, I will run out from class to the toilet and cry there. My boarding house and my home at Godean were also the places when I was going through both my manic and depressive episodes. Umm… How long did you spend to finally able to control yourself? Truthfully speaking, up until now, there was several times when I couldn’t control myself, and let those negative thinking and feeling to appear. But after I hospitalised in RSUP Sardjito in the end of year 2014, I began to be able to control myself. Alright, this is going to be a ‘professional’ question. You’re a pharmacist-to-be, right? HOW is the emergence of psychotic medications to manage bipolar disorder? Are they essential, not essential, or…? Then, you know that antipsychotic medications have undesirable (if not terrible) side effects. I bet you’ve experienced them as well. And most patients stop to take their drugs because of the side effects. So in your opinion, WHAT should be done to make the patient adhere to their drug therapy? I got three medications. Depakote, risperidone, and trihexyphenidyl (THP). Depakote is a mood stabiliser. Our brain consists of millions of neurons which constantly deliver information from one cell to another. To keep them works constantly, brain produces neurotransmitters to carry the ‘message’ from brain to other organs. For example: dopamine, serotonin, and norepinephrine. Bipolar disorder is caused by the imbalance of the neurotransmitter concentration. Thus, Depakote, with sodium divalproate as its active ingredient, will work to stabilise the neurotransmitter. Risperidone is a antipsychotic, anti-hallucination, because I often experience hallucination. For THP, it is used to overcome the tremor side effect of risperidone. In my opinion, it is highly important to keep consuming the medications, because it will be a great help to control the condition and keep the mood stable. I’ve told you before that I once stopped to have my medications, and I ended with relapse. Because I felt far better back then, I slept normally, everything seemed so normal. Those medications cannot stop abruptly. When I was using them for the very first time, I felt constantly sleepy, like I was flying, hehe. But after sometimes, I could cope and adapted with their side effects. Honestly, to increase patient’s adherence on consuming their medications, it needs a good collaboration between doctor, pharmacist, patient, and caregivers (family, friends, or colleagues). Because like I said, patient can stop their medications abruptly as they feel their condition is getting better. Healthcare professionals should give a complete education about patient’s therapy, to make sure that the patient himself involves in the therapy. Caregiver’s role is also essential, because they can remind patient to take their medications. Their support also gives hope to patient, and make them feel they’re valuable, they have to be better soon. WHO did help you greatly while you were struggling with your condition? It was my family and my friends. They showered me with constant support. And they always bring me up every time I depressed. It was so meaningful, and above all, it’s God’s support. You seem very active in a lot of bipolar disorder forums—you even famous on Facebook, globally! (Bona’s picture was posted in International Bipolar Foundation’s FB account to celebrate World Bipolar Disorder Day, 30th of March 2015)—actually, WHY do you put so much passion to spread the words about bipolar disorder and mental illness? And WHY do you so open in the FB’s timeline to state that you’re living with bipolar disorder? Actually I was interviewing you because I admired your spirit. Well, it’s actually a good question! I know right. I am good. Uhm, anyway, please proceed. I have several objectives on why I’m so active spreading the information about mental illness, as well as being so open in social media. First, because it has been my passion to be a mental health and mental illness activist, in order to increase people’s awareness and change the negative stigma they put to mental illness. Second, I want my friends who are (mentally) healthy, to keep not only their physical health, but also their mental health. Believe me, living with mental illness is unbearably hard. Third, I want to help my friends who also have the same condition as me, but they’re too afraid to admit it or to share their stories with. After I declared that I got bipolar disorder, lots of my friends shared their problems. I was only hear what they said and also share how I cope with my problems. Because in the end, all they need is to be completely heard. Suicidal attempt has been the most prevalent mortality cause for patient with bipolar disorder. WHAT do you think about it, and HOW do you refrain yourself from doing such act? Like they (the ones who talk so) ever be in heaven. Actually, people who did suicidal attempt didn’t want to run from their respective problems, but they want to end their pain and suffering. I quoted an article from a psychiatry named Dr Andrew Slaby: ‘Imagine the most severe physical pain you’ve ever felt—bone fracture, dental pain, or labour pain—multiple them by ten and imagine you don’t know the cause, then you might presume how torturing depression is’. Or else, people who commit suicide might hear some whisper which commanded them to do the suicide, and they could not oppose that whisper. I wish people don’t simply give negative stigma to people who committed suicide, why don’t they just pray for him/her? What I’ve done to keep myself from such attempt was to keep myself close to God, for me my faith is a great defence when negative thoughts or suicidal attempt appear. When I got the feeling of killing myself, I always pray and think that my family and friends still want me to be alive, and that there are dreams I haven’t reached yet. WHO is a figure with bipolar disorder whom you admire? And why? Actually I have not yet found a person with bipolar disorder that I admire, but I have some role models in my mind. First is Sigmund Freud. He is the creator of psychoanalysis (I bet all psychologist or psychology student must know about this! ), I admire him because when he trapped with severe depression because of his past, he tried to analyse himself until he could figure his problem out as well as create the psychoanalysis theory and dream interpretation. The second figure is John Forbes Nash. He is a mathematician, Nobel laureate in economics, and the algorithm he created can be used to determine cheap airplane tickets. And he is schizophrenic. I admire him so much because when he was living with schizophrenia, he did not give up, he fought by all his mean to overcome his condition, particularly to overcome his hallucinations that greatly disturbed him—it even threaten his life. And finally he could get the Nobel prise. ‘A Beautiful Mind’, a film that adapted John Nash’s life story, is a must see film for me every time I have my depression. I’ve watched it for times! Let’s talk about something else. After you graduate, WHERE so you want to work? Hmmm after I graduate, I want to work in a pharmaceutical company, in the marketing department. It’s not that I don’t have a passion in clinical things, but I like marketing world and want to learn more about it. And after I have enough saving, I want to develop my pie business which I’ve built with my friends Sita and Vento. Its brand name is ‘Laksita’. I also want to take an English course until I’m fluent, because I have a dream to get a Master degree from John Hopkins University. I got many publication journals about mental health and mental illness from that University. I want to be more professional on those subjects, therefore I can be a mental health and mental illness activist in a bigger scope. That’s the plot, more or less. Wow! So well-planned! Okay, now we’re entering a section called question 123. 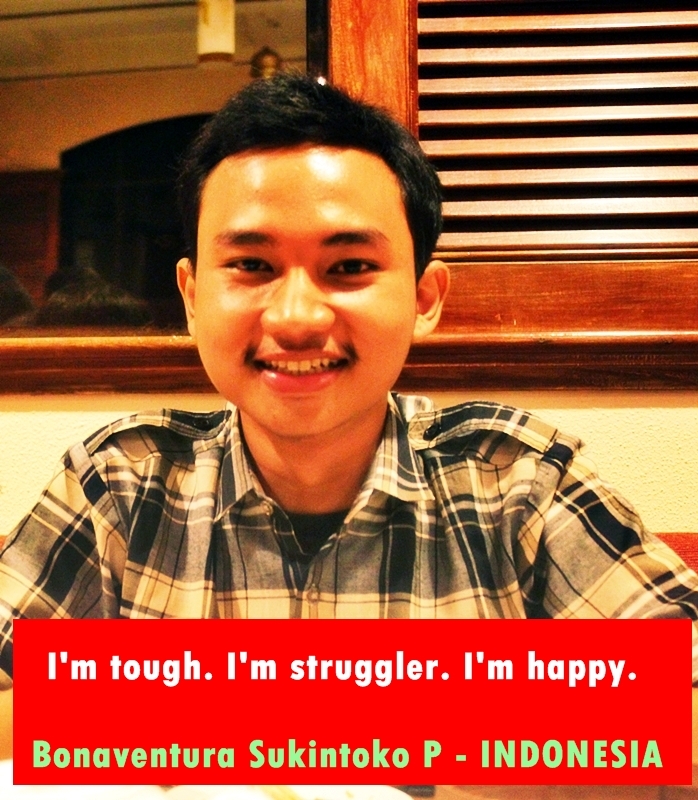 Mention 1 opinion of yours related with stigma about mental illness in Indonesia! People majorly think that patient with mental disturbance is a dangerous person, a shame or disgrace, and closely related with mystical or magical practice. For example, patient who have hallucination is thought to see devil or get possessed. Mention 2 medications that accompany through the time! I am the one who thank you, Bon. Secondly, mental illness is not a curse or a shame, or a disgraceful matter for me. Mental illness, especially bipolar disorder, is something God gave to make me a more mature human, a stronger one, and more caring to my surrounding. Third, for everyone who read this blog and interview, don’t forget to not only keep your physical health but also your mental health. Be thankful, because for me gratitude is one way to thank God, the nature, and everyone around me. Since this week was also a Mental Health Awareness Week, I hope you can leave out those negative stigmas about mental health and mental illness. Maybe it’s just a little part of my experience that I shared with you, but I hope my story can inspire you all, that keep on fighting is a human duty to keep alive. Okay, Bon. Many thanks! Hope you’ll graduate soon! People said that Mayweather Jr only run on the ring and won, many other people said he cheated, but some others are agree with him. There are so many things we’re not familiar with in this world, and unfortunately, the unfamiliarity does not stop us from giving justification. Because this month we celebrate mental health awareness, we should think from a different perspective. So, after you meet Bona, will you still easily give the same stigma? The answer is within our own life. Greetings from Interv123! This entry was posted in Interv123 and tagged BAPD, bipolar disorder, depakote, english interview, happy, interview, mental ilness, reason for suicide, risperidone, struggler, suicidal impact, why they suicide by ariesadhar. Bookmark the permalink.